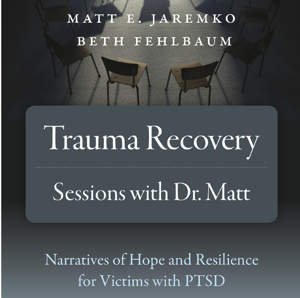 If you’re suffering from the effects of a trauma in your life or know someone who is, then listen to Dr. Matt Jaremko talk about his new book with Beth Fehlbaum called Trauma Recovery: Sessions With Dr. Matt. Dr. Jaremko’s approach to therapy with trauma victims is straightforward and respectful. It’s about helping survivors get their confidence back and move forward. Individuals suffering from PTSD of many kinds will find this episode especially helpful. Students of psychology will also see how the ideas of Albert Bandura and Arnold Lazarus come together in a fascinating therapeutic technique. I send this reply to share with you a song I often use when trying to help folks overcome traumatic life events. Please note the name of the English songwriter. Perhaps a distant connection? Thanks for having me on last week.